← Just announced! The Sound of Sleat at Baldwin’s Station! Rising from a milieu of lovelorn singer/songwriters, John Gorka illuminates instead with his trademark wordplay, twisting, tuning and typing words and phrases in the way a balloon artist creates complex creatures from simple balloons. Few contemporary songwriters coax language as deftly as Gorka. For over two decades, Gorka’s keen ear has picked up the stories of those along his path, folding them into poetry and song. His keen perceptiveness inspires people from all over the world to share their stories. By involving those tales in his music, he escapes the trap of introspection that hobbles less gifted singer/songwriters. John Gorka flies below the pop culture radar with an almost cult-like following that never fails to fill concerts. Speak with any of his fans and one instantly feel’s their enthusiasm and genuine affection. His shy, almost self-effacing stage presence rightfully focuses attention on the songs. John’s versatility on guitar and piano keeps his sets musically interesting, while his rich baritone effortlessly executes his bidding. And he’s never short of the sly comment or clever joke that invariably ignites his audience. 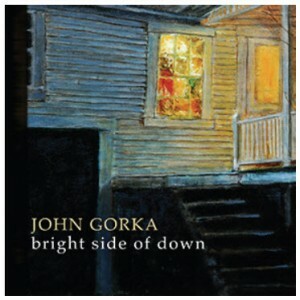 Red House Records is proud to announce the release of the new studio album by John Gorka, “Bright Side of Down.” The first release in over four years from the acclaimed songwriter widely regarded as “one of contemporary folk music’s leading talents” (Vintage Guitar), the album’s 12 songs are beautifully produced and sequenced from beginning to end. With guest vocal appearances by Red House labelmates Lucy Kaplansky, Eliza Gilkyson, Claudia Schmidt and Michael Johnson, the collection resonates with the classic, “Gorka-esque” sound and lyrical insight that’s earned him generations of devoted fans and a career that’s found him gracing the stages of ‘PBS’ Austin City Limits, NPR’s Mountain Stage and venues worldwide. Posted on July 6, 2014, in Special Shows and tagged John Gorka, Kipyn Martin, singer/songwriter. Bookmark the permalink. Comments Off on Opening for John Gorka on July 26th: Kipyn Martin.